It's been a long week of dribbled information from Project Ara, and today is no exception with another series of tweets. This time, Project Ara took to Twitter to say that it was joking yesterday when it posted "No more electropermanent magnets," along with the hashtag #FailedTheDropTest. The tweet led many to speculate that this is why the handset's launch was delayed until next year. But today, the Project Ara team tweeted: "BTW #FailedTheDropTest was a joke. Didn't fail. We have been configuring a new solution. It's better too. #WorkingOnOurHumor". 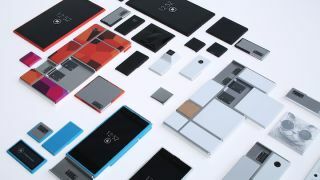 It now seems that the delay is due to Project Ara not only working on a new solution for how modules connect within the handset, but also due to it tinkering with some of its components as well. Project Ara posted two other tweets today as well, saying that it was also working on a better camera and a better battery life. Either way, we're happy to hear the Project Ara team is working on its humor, too.